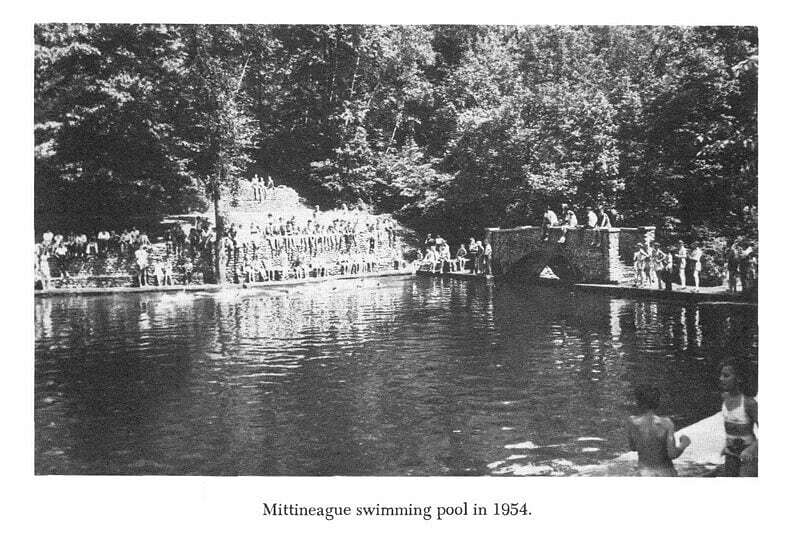 Historical photos of Bear Hole, Mittineague Park and other related. Bill Ashley for researching the old railroad line that traversed Mittineague Park's peninsula, The Town of West Springfield for providing us with photos of the Bear Hole Reservoir re-construction and post Hurricane Diane destruction, as well as to Robert Gubala for photos from Millville Road and Massasoit Spring in Bear Hole that he researched at the Holyoke Library historical archives. 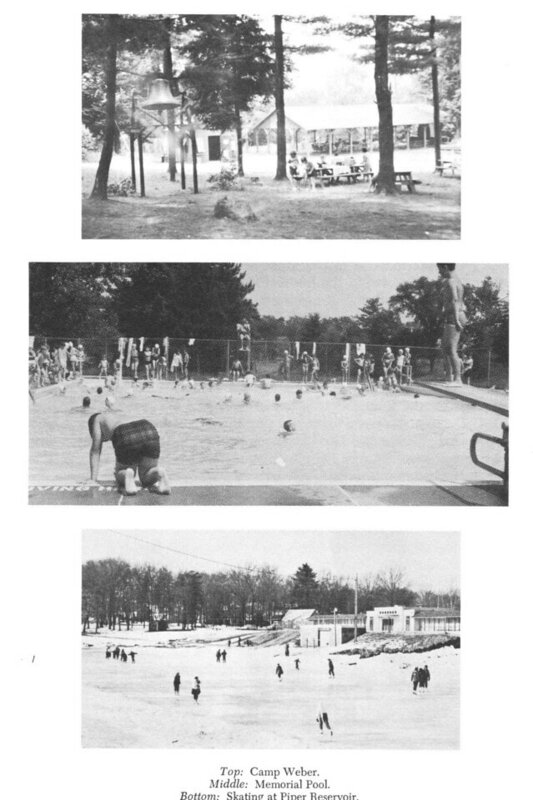 Undated photos from YMCA Camp Weber, which still abuts Bear Hole, swimming at Memorial Pool and of skating at the Piper Road reservoir. The YMCA camp utilizes Bear Hole for nature themed activities during the summer. Railroad underpass at the top of Millville Road in Bear Hole 1902. Passage leads to currently day Ashley Reservoir, but is filled in to prevent off-roaders from entering Ashley. Shown in photo C. Robert Wilhelm. 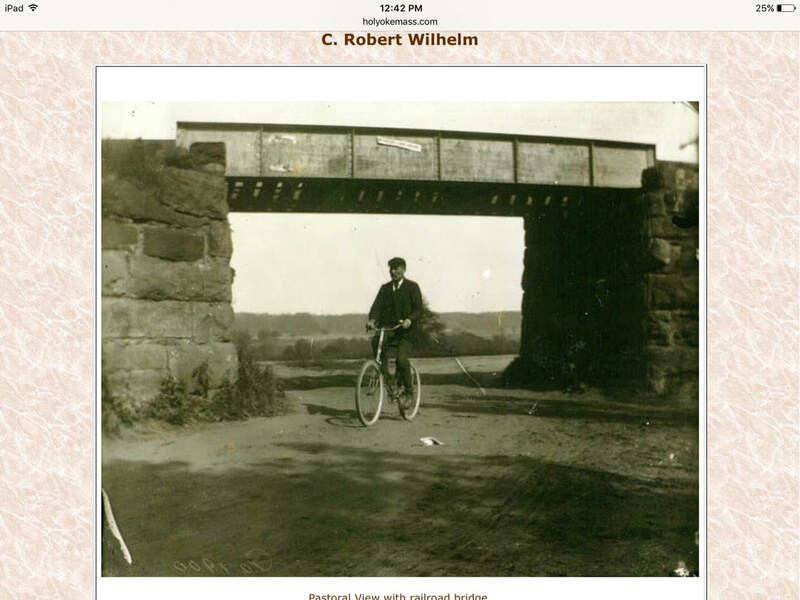 He was a German immigrant and active with Holyoke's German community. Wilhelm was mechanically minded and owned his own company, Wilhelm and Derich’s Bottling Company. 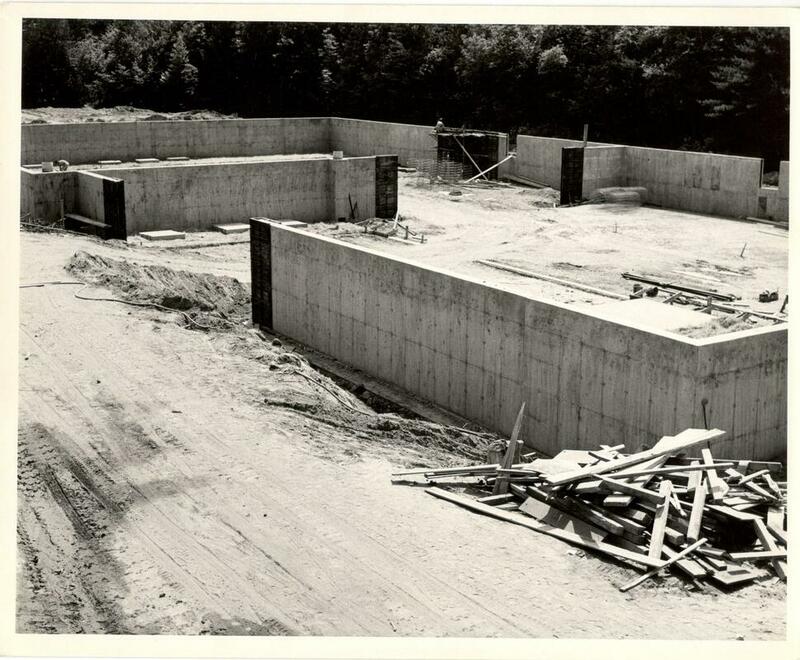 This photo was taken from the West Springfield side, current day Millville Road. Ashley Reservoir is in the background. Photo c/o Robert Gubala and the Holyoke Library historical archives. June 2010. Comparison photo. Current day remnants of the Bear Hole Restaurant "bear's den". Looking at what would have been the "den's" front. 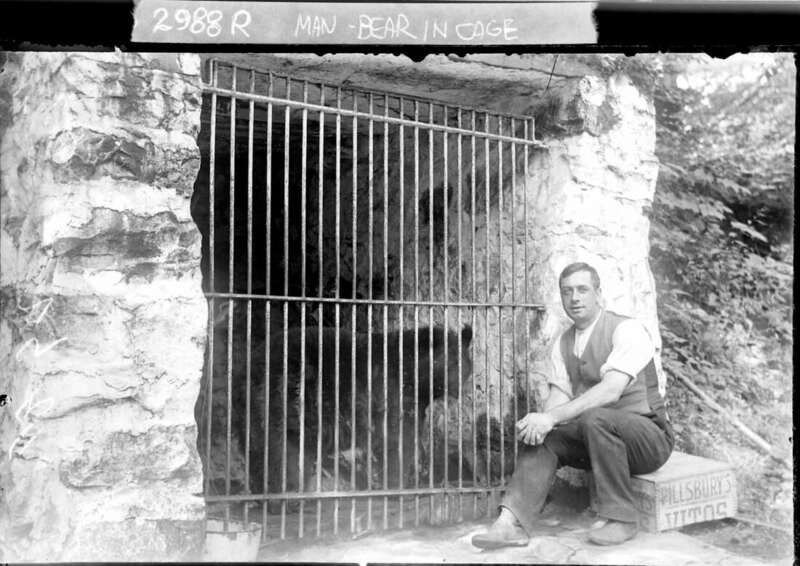 Top section of the gate shown in preceding photo (Masse brothers) - flip the gate upside down for a match to this photo and below (Black Bear and unidentified man). Lower right corner is an underground cavity that's suspected to have been part of the den. Den wall remnants visible to the left, center and rear right. 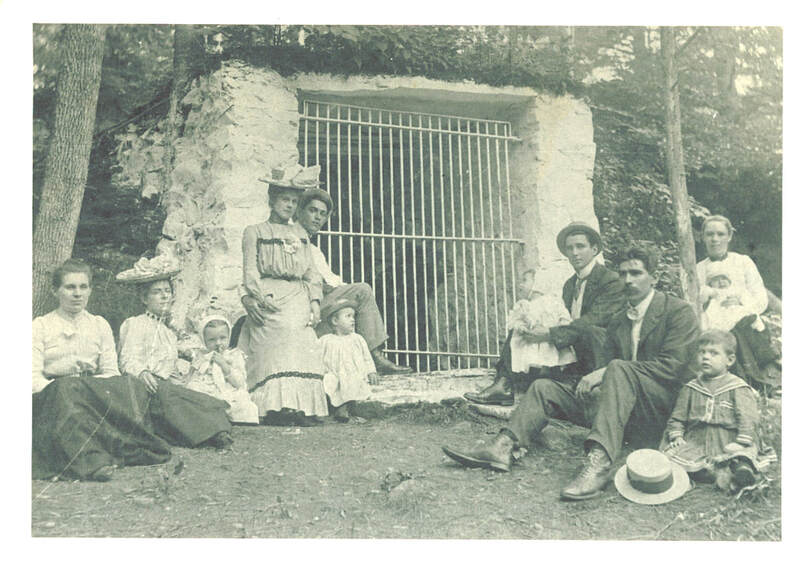 Was not a large enclosure compared to today's humane standards. Located within a hill. To the far right would be the cascading waterfall within the restaurant glen. 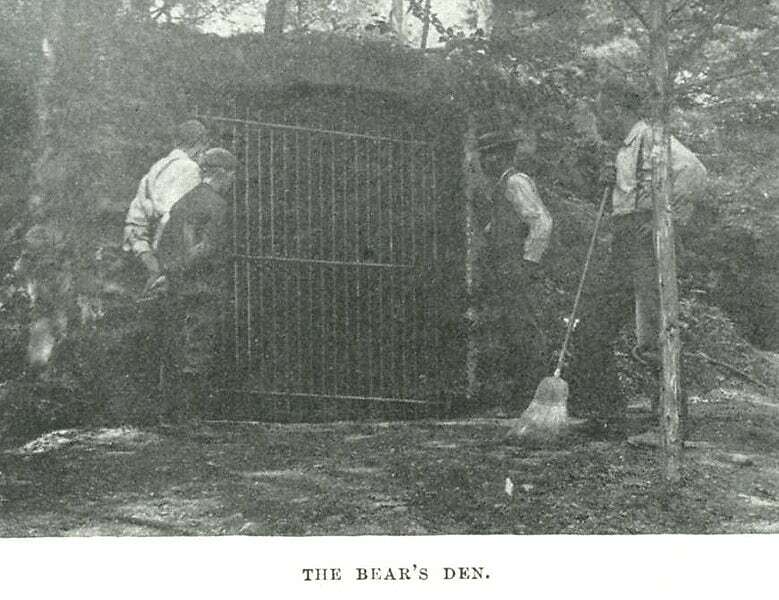 The black bear & unidentified man at the bear's den at the Bear Hole resort. Photo approx year: 1897-1908. 3 legged bear from the Adirondacks. The bear's den at the Bear Hole restaurant. Undated. 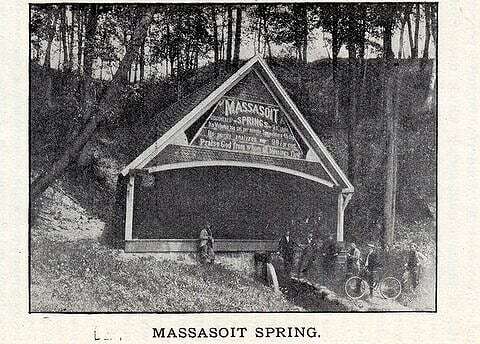 Bear Hole: Massasoit Spring pavilion close-up. Courtesy of Robert Gubala's research at the Holyoke Library historical archives. 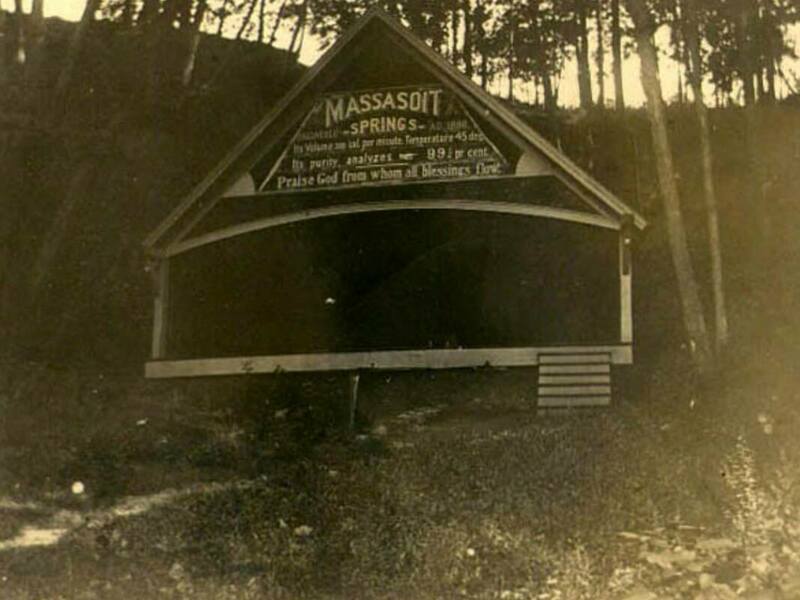 Massasoit Spring pavilion at the glen of the Bear Hole Restaurant. This area is now overgrown and swampy, but the spring still flows. 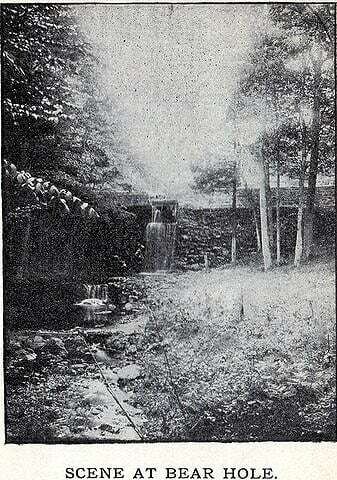 Cover of historic 1896 5"x7" booklet promoting the highly acclaimed Massasoit Spring within the glen of the Bear Hole Resort. 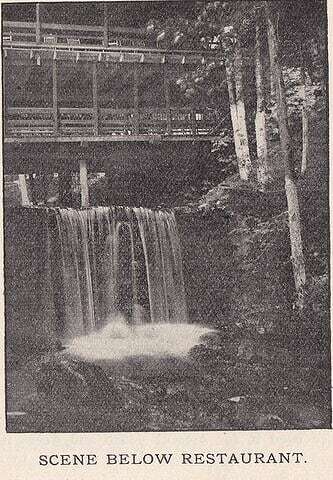 Scanned from a 5" x 7" booklet promoting Massasoit Spring at the Bear Hole Resort. Booklet dated 1896. ℅ W Spfld Historical Commission. 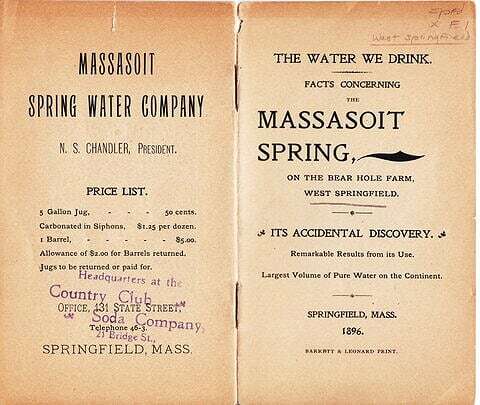 Ad promoting the water from Massasoit Spring, located within the glen of the Bear Hole Resort. Water bottled & sold in Spfld MA. 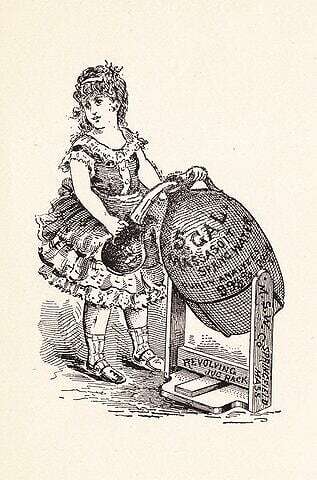 The water was advertised having health properties and unmatched purity. 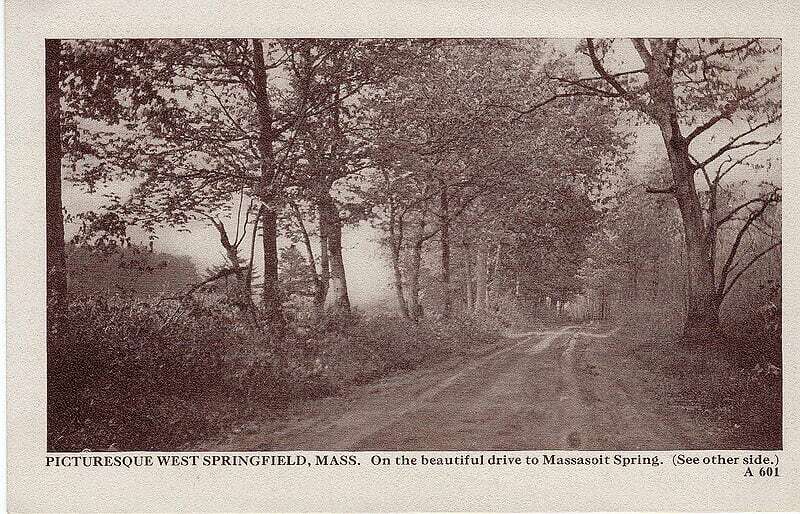 Road leading to Bear Hole Massasoit Spring and the Bear Hole restaurant. Undated. Scanned from 5"x7" booklet. 1896. Bear Hole cascading waterfall. Scanned from 5"x7" booklet. 1896. Manmade waterfall above Bear Hole resort. Notice lawn in foreground. Now reverted to woodlands. Magnificent waterfall at Bear Hole along Paucatuck Brook. This is above the restaurant at the current day overpass enroute to the resort's glen. To the right was a grassy area used for picnicking and cookouts. Now reverted to forest. Opposite side of the waterfall was a man made pond that was used for row boats. The pond had a high enough water level to feed the waterfall seen here. 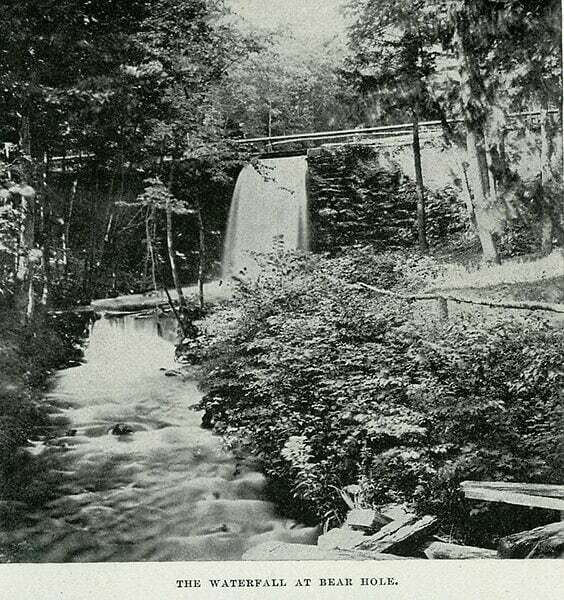 Bear Hole day resort / restaurant built over Paucatuck Brook & boardwalk leading to Massasoit Spring. An impressive two-story open air structure. A "Howes Brothers" photograph. 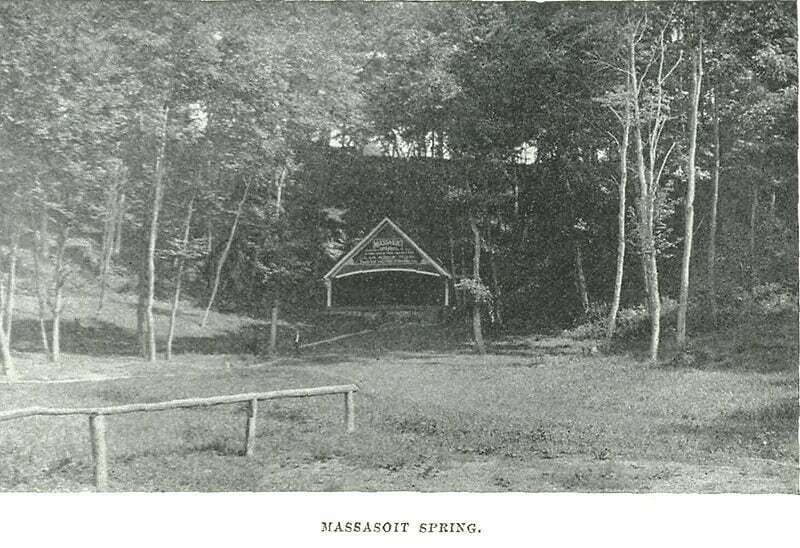 Notice the boardwalk at the photo's bottom, which lead to Massasoit Spring. Chimney, which is still standing today. 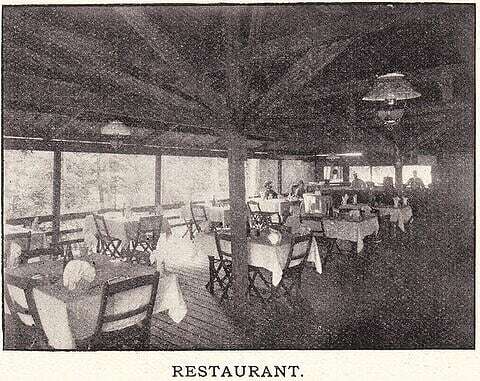 The restaurant began operating around 1876 until its demise at approximately the turn of the century when the town took the land by eminent domain for the creation of the reservoir watershed. Inside the Bear Hole Restaurant. Chimney fireplace is in the background. 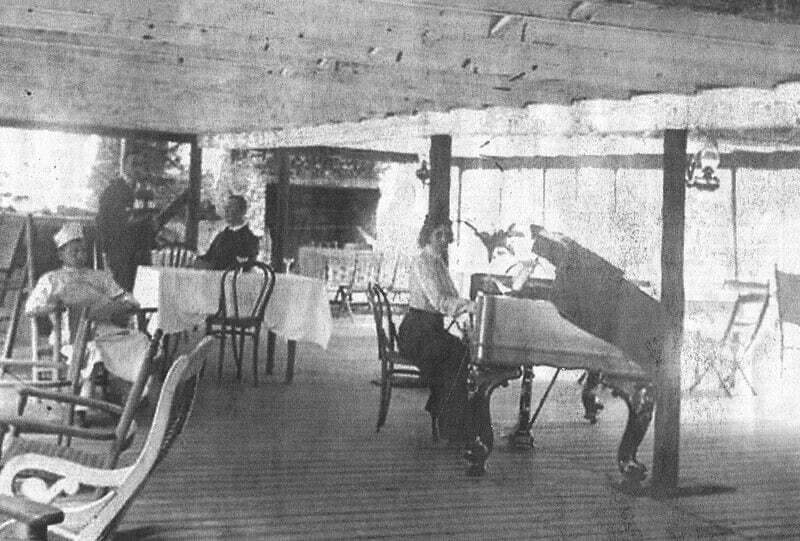 Approximately 1896: Inside the Bear Hole Resort restaurant. Scanned from a 5" x 7" booklet. 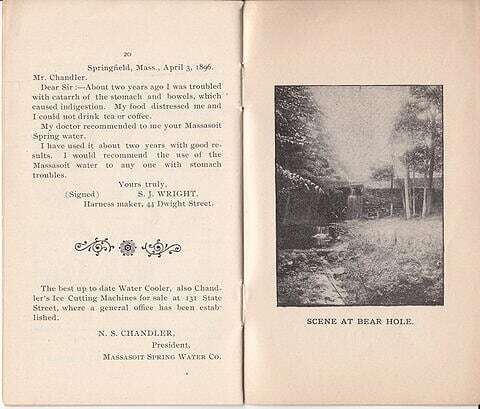 Scanned from a 5"x7" 1896 booklet about Bear Hole & Massasoit Spring. 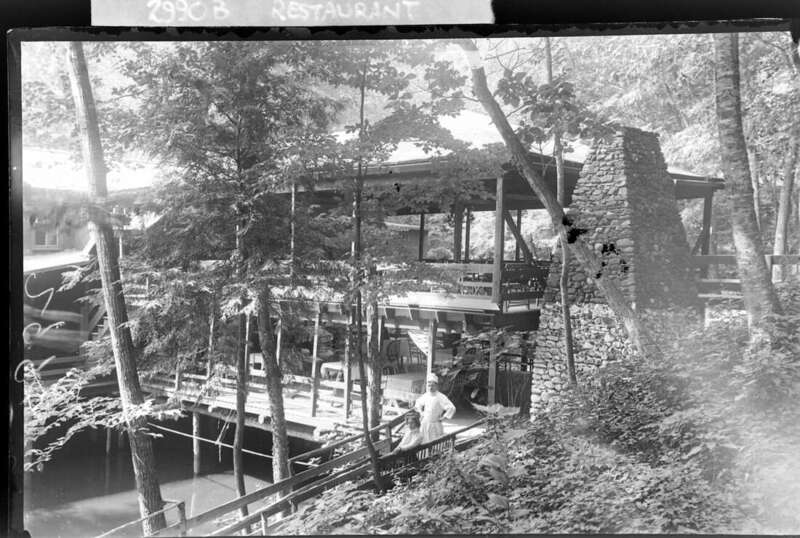 Photo shows resort over brook & waterfall flowing over a dam underneath the restaurant structure. Comparison photo. 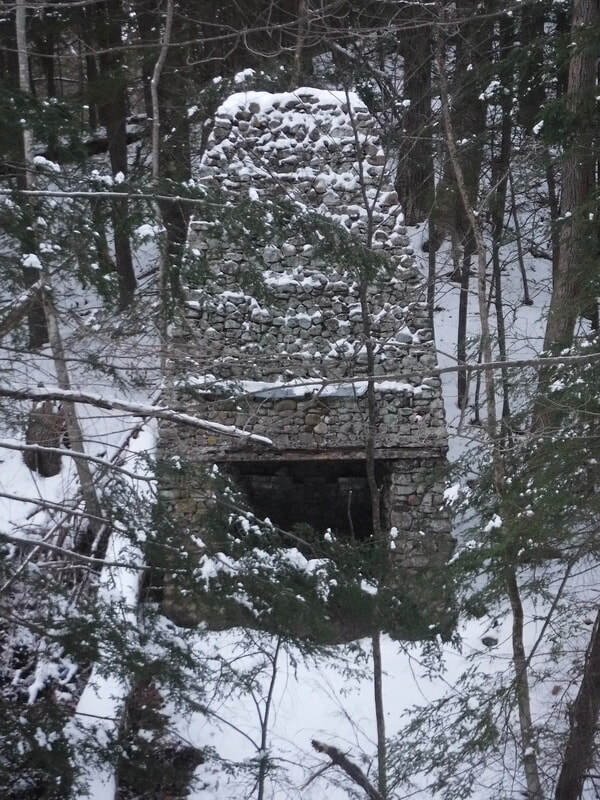 Current day Bear Hole chimney situated on a steep hill along Paucatuck Brook. Over 140 years old. In recent years masonry rehab work was done to the base to help ensure the structure's integrity and to help prevent collapse. 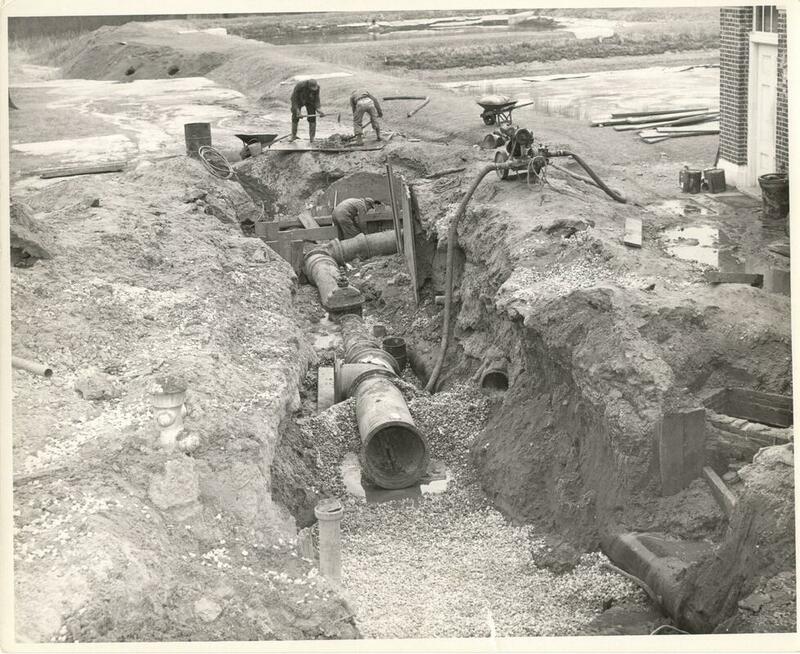 Work was coordinated by the West Springfield Historical Commission. The chimney is easily viewed when visiting the restaurant glen. Undated photo. 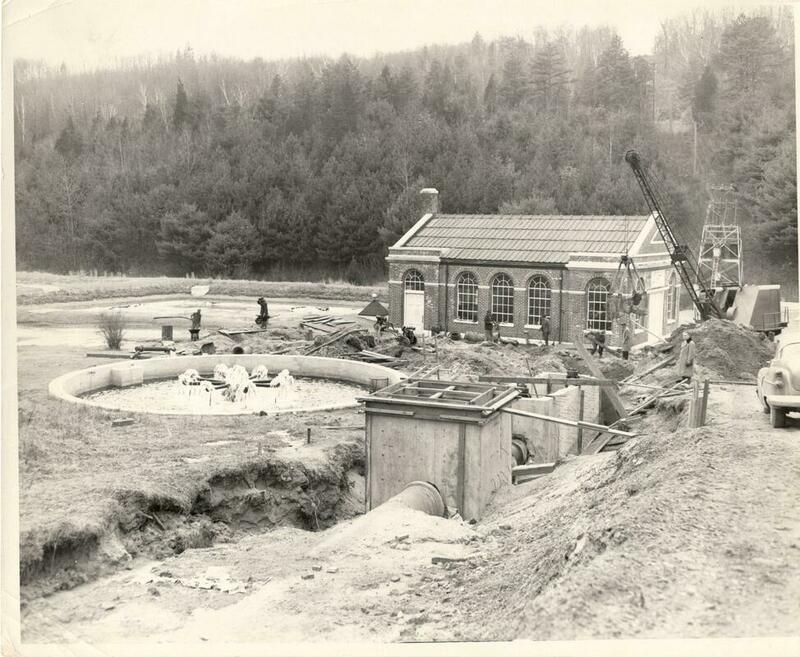 Original Bear Hole pumping station with aeration pool and 24 inch water main in foreground under construction. Hurricane Diane 1955. Road washout & dam breached / reservoir drained. Road washout, notice the white garage, which is still standing today. 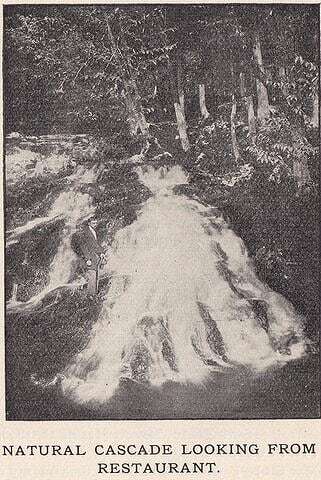 When the dam breached the reservoir was reverted back to its natural state - a brook. 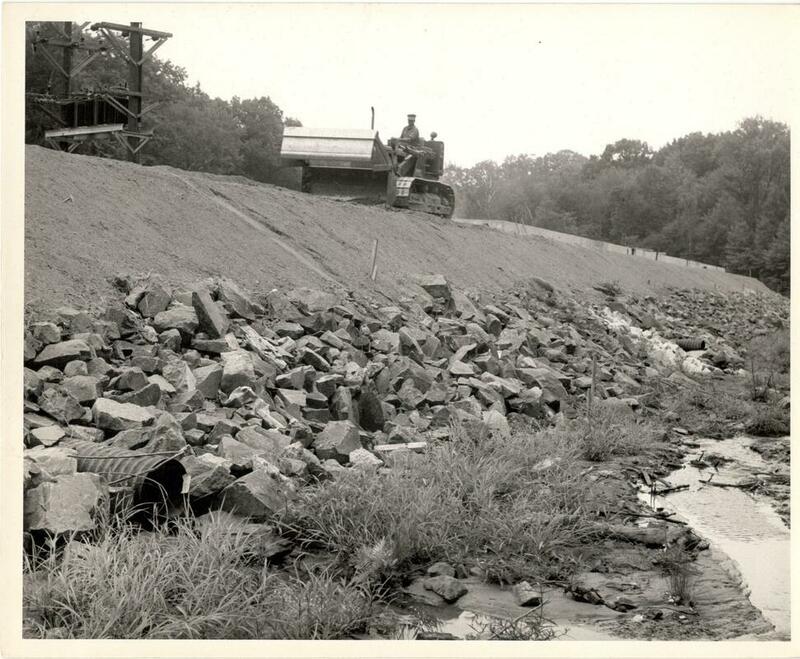 The cement structure shown is still present today and was part of an intake spillway. 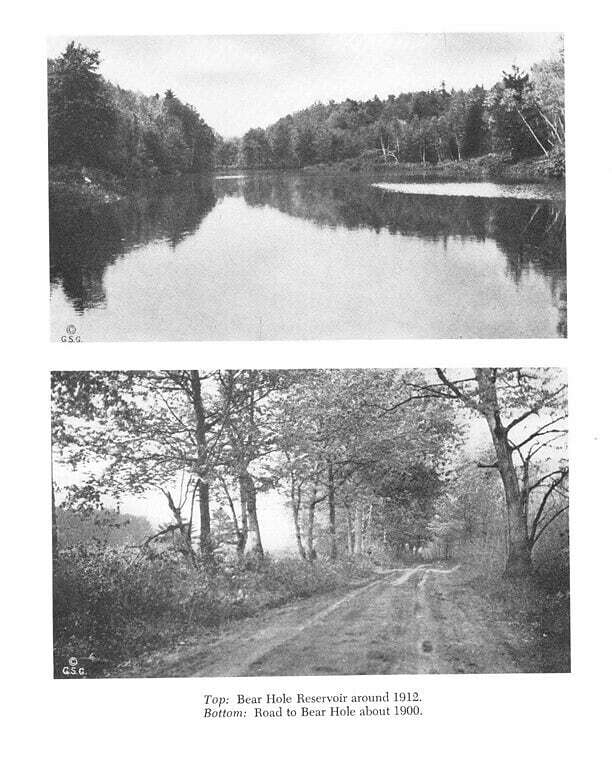 The reservoir is man made and technically part of Paucatuck Brook. November 23, 1956. 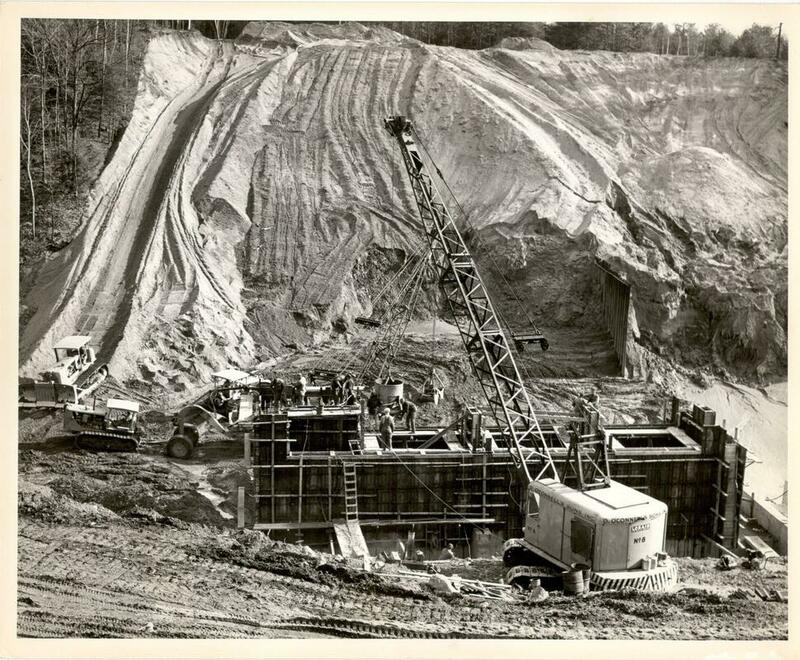 Construction of Bear Hole Reservoir's new spillway. 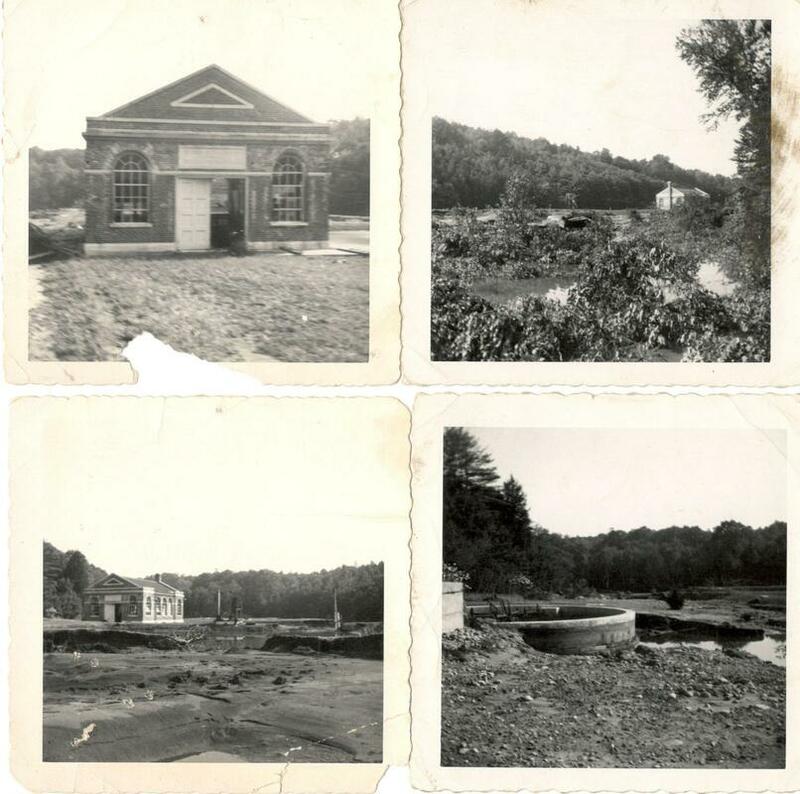 Reservoir was expanded after Hurricane Diane, August 1955 that destroyed the reservoir and infrastructure. Construction done by Daniel O'Connell & Sons (DOC). Photo taken by Neil Doherty. November 23, 1956. 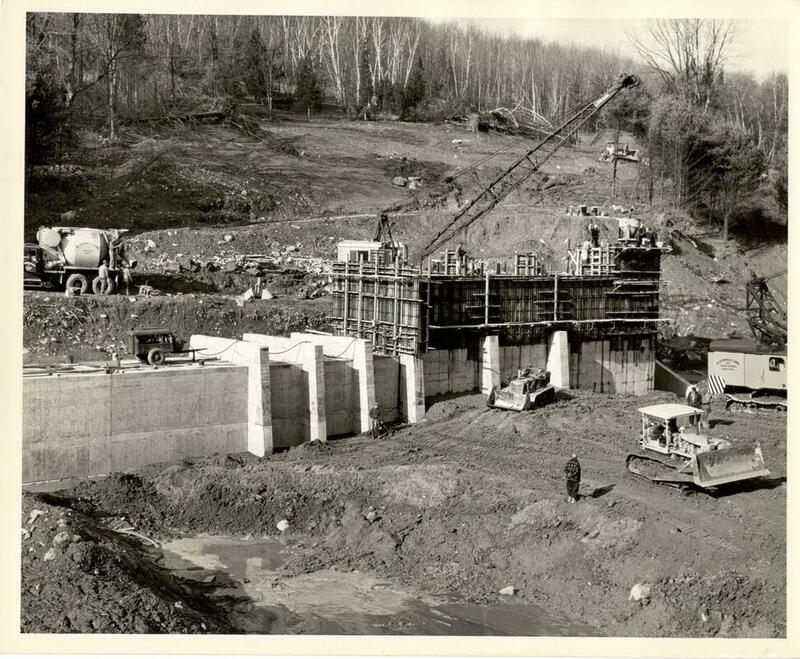 Base of the new spillway for Bear Hole Reservoir under construction. Photo by Neil Doherty. May 6, 1957. 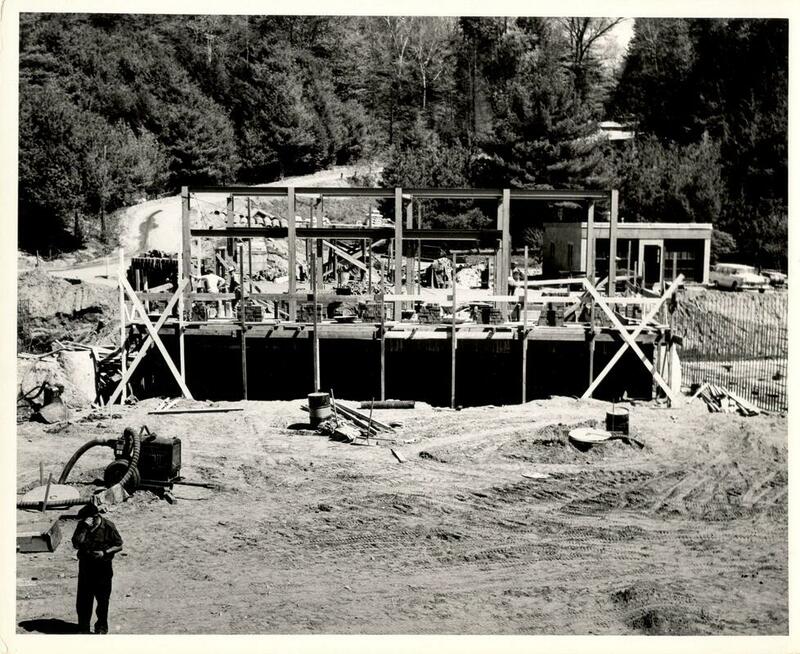 Construction of the new and current day Bear Hole Pumping Station. In the background is the current day road that leads to the building. Garage to the right, which is also still present today. Photo by Neil Doherty. November 23, 1956. Construction of the new / current day filter beds. We presume the pumping station would be off to the right out of view. 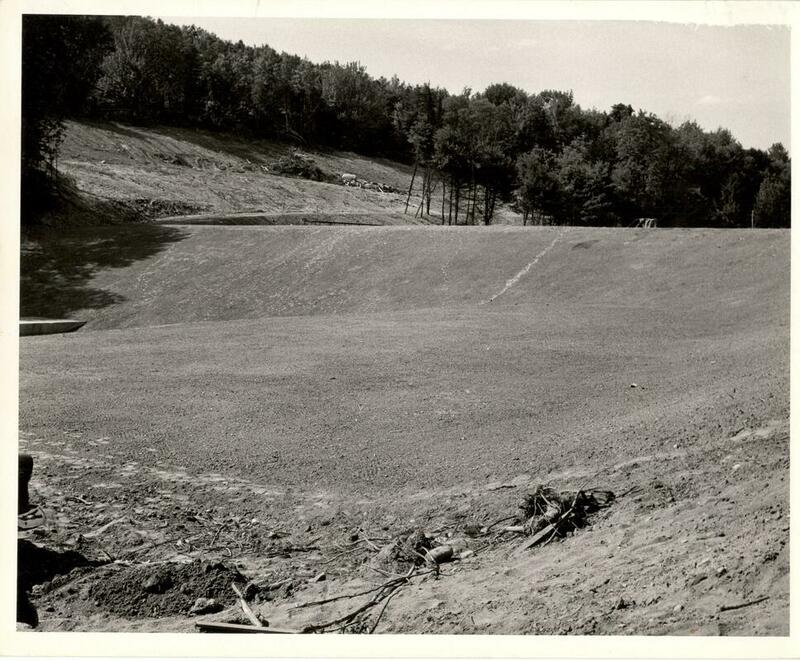 Piper Road Reservoir after the dam/road collapsed (shown at top) due to 1955 flood. 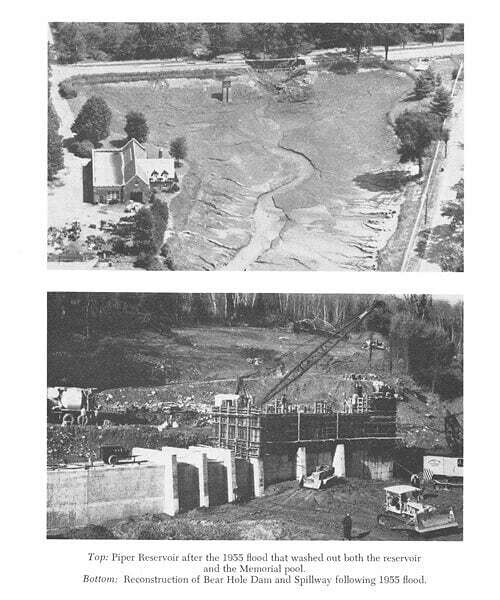 Lower photo shows Bear Hole spillway re-construction after 1955 flood. 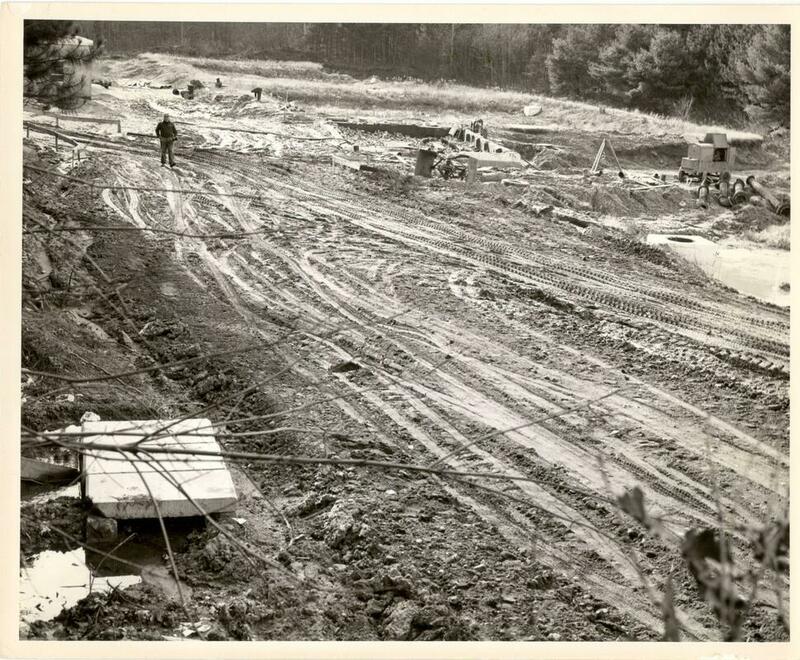 1955 flood washed out the original Bear Hole dam. Central New England Railroad bridge spanning the Westfield River. 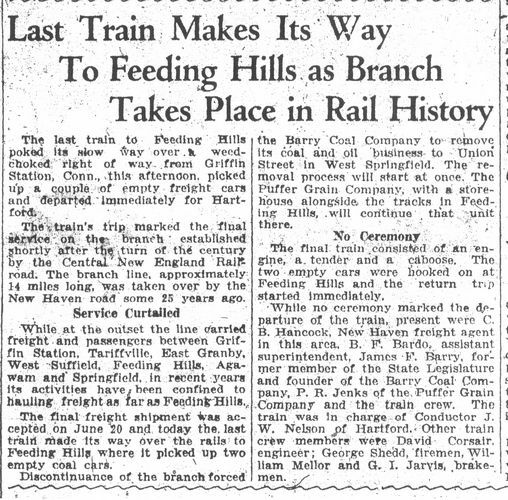 "Feeding Hills Line"/"Agawam Junction". Looking from Robinson State Park towards Mittineague Park peninsula. 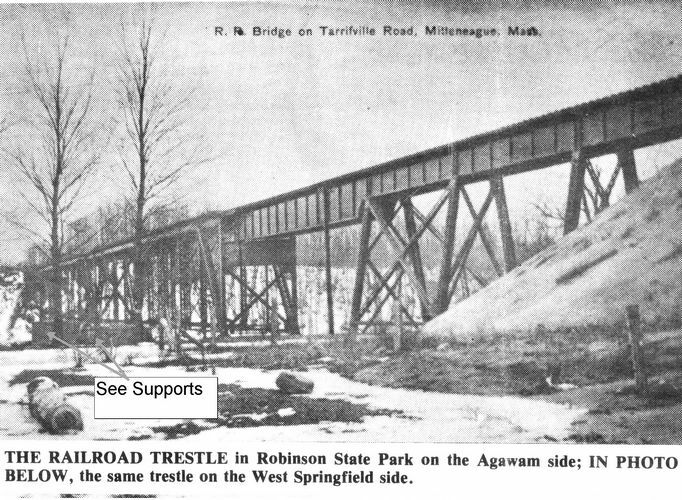 The trestle across was in place by September 1899 and the first passenger car crossed September 8, 1902. The rail track was built by a pick and shovel crew who used mules. 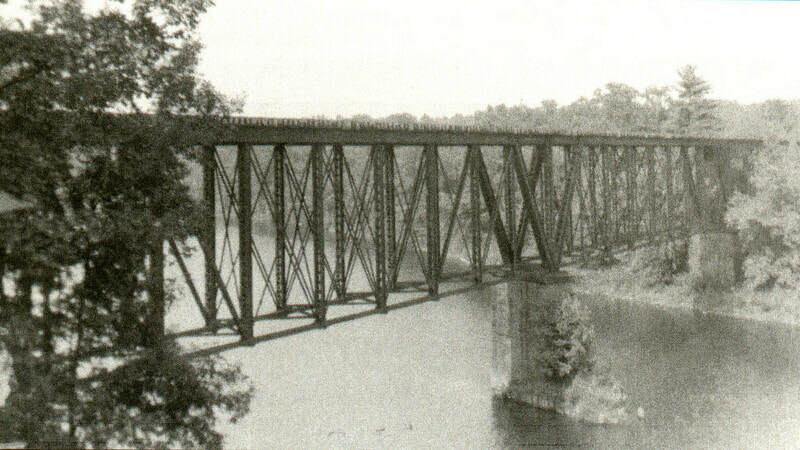 The bridge was built by the Phoenix Bridge Company of Phoenixville, Pennsylvania. An outfit by the name Ryan and Kelly, of Philadelphia, graded the route. 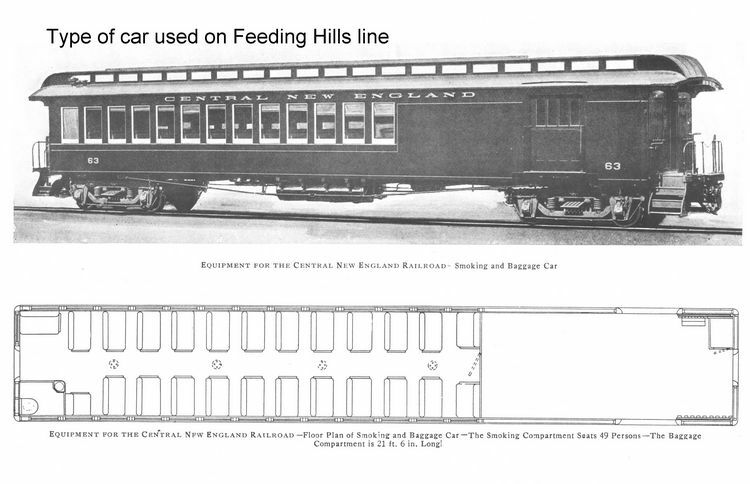 Passenger service ended 1921. Freight service continued until July 1, 1938. 1938 the line was legally abandoned. January 1, 1927 the CNE Railroad merged to become the New York, New Haven and Hartford Railroad. 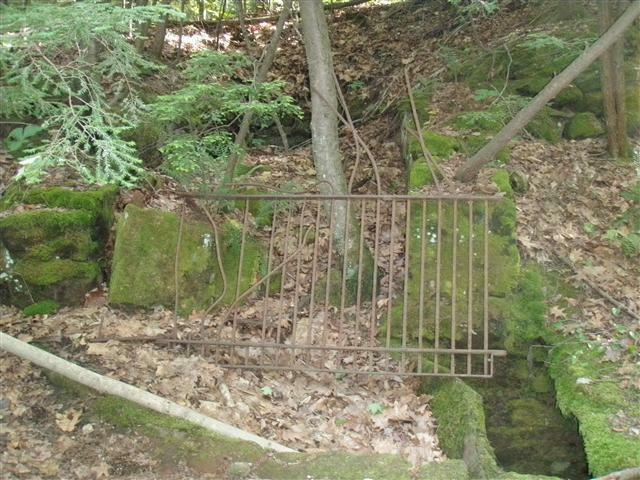 Bridge was intact until sometime between 1938 and early 1940s when it was scrapped for the WWII scrap metal drive. 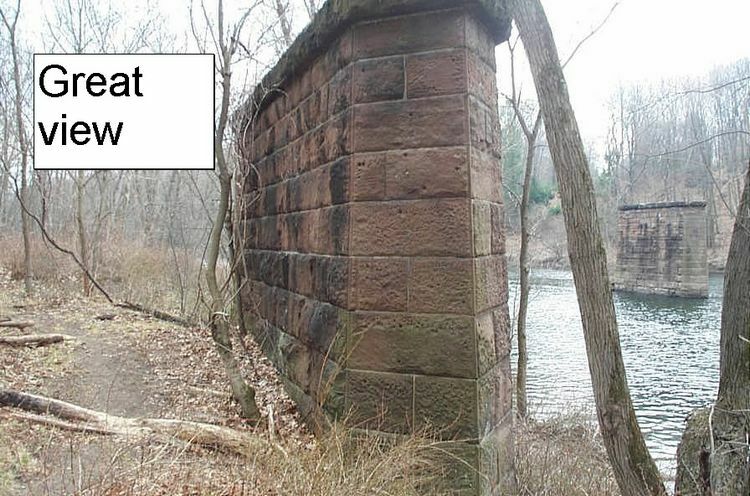 Large stone abutments, one shown here in the river, are still present today on the park's peninsula and at Robinson State Park. The track traversed the park's peninsula and connected to the Boston & Albany Railroad tracks, current day CSX tracks. Research c/o Bill Ashley. Photo c/o Agawam Historical Association. A land view of the railroad bridge crossing between Robinson State Park and the Mittineague Park peninsula. 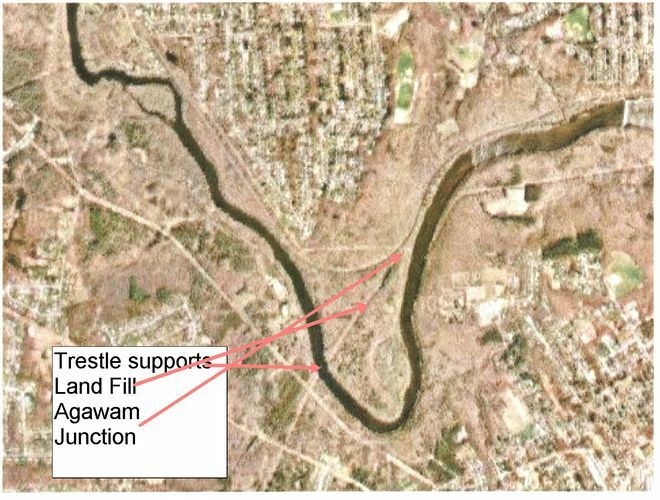 Knowing the contour of the land on both sides, we believe this is a view from the West Springfield side, not Agawam. c/o Agawam Historical Association. Current day view from Mittineague Park of the railroad abutments.